Lady In Red Slots - Read Lord Bingo's review to WIN! Step 1: Click on the red circle to increase or decrease your coin selection, then on the coins button increase how many you wish to put to place your bet on Lady In Red Slots. 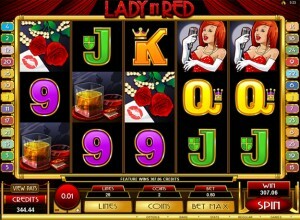 Step 2: Lady In Red Slots has twenty five possible pay lines that you can choose from, so when you decide how many you wish to have activated in your game, click on the lines button to alter that amount. Step 3: If you wish to go for the progressive jackpot, you'll need to hit the bet max button, otherwise a simple click on the red spin button, should do it. It is rare that you will come across a slot machine that is both innovative and incredibly different from many of the others on the net. Lady In Red slot machine, isn't one of them I'm afraid. The cliche and overused theme of a sensual elegant slot in a rich man's world has been portrayed a thousands time over. We're just too familiar with it. The Lady In Red slot game is a standard five reel, slot using all of those playing card highs that we're all too used to seeing, along with some rather unimaginative icons and scenes from the glitzy and glamorous world of the well off. The Lady In Red logo acts as your wild card, with the paparazzi “gentleman” as your scatter card. In Lady In Red Slots, there is a potential £375,000 jackpot available to you, if you play the maximum bet, and accumulating three or more of the scatter symbols will warrant you free spins in the game. All wild card wins are doubled too, and five wild cards would see you net £125,000 on this slot game. But short of that, there really isn't anything to get excited about. There are any number of online slots with equally frustrating waltz music to lure you in believing that your sat at home staring into the world of the famous. To me, playing Lady In Red slots for free is possibly the best option available to you. I don't see the allure of this slot, that has attempted to be charming, but failed so miserably. 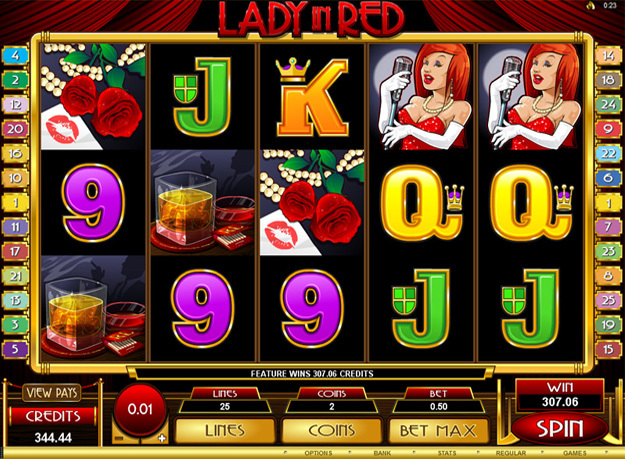 Surely, the Lady In Red Slots demo, is all the excitement your going to get from this title.